Welcome to some comic relief. This area will house all of the JrSB comics created by our webmaster - Joe Auricchio/Pegasus - from 1981 till 1983. 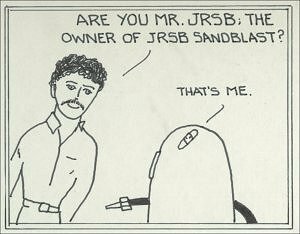 JrSB stands for Junior Sandblast. Joe's very first company was JrSB way back in the 1960's. It evolved into ADSTONE Sandblasting then ADSTONE Designs and then into the ADSTONE World Wide Network. In 1997 Joe sold off the network and held onto the design business which evolved into MyDrawingBoard. 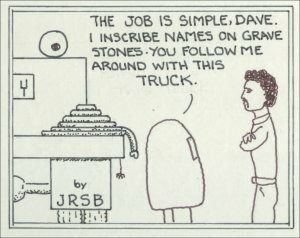 The stone cutting business was turned over to David Bliss - Dave Blast as he is known in the comic strip. 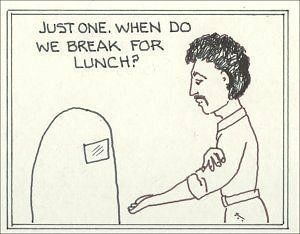 The JrSB comics record Joe's beginnings when he and David started out together as kids cutting cemetery inscriptions. 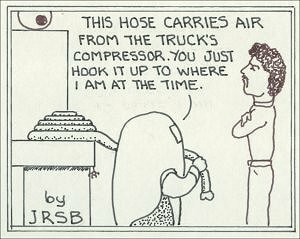 JrSB is featured in the comic strip as always wearing his sandblast hood. Today, Dave owns his own sandblast/power washing business called CHOICE. 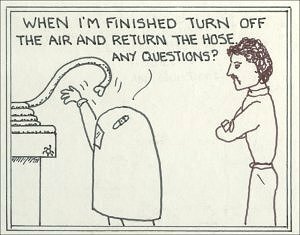 The comics reflect real life in an uncanny way, every "story" has its basis in a true manifestation in Joe and Dave's career and personal lives. Click on any panel to see the image full scale.